Health inequalities have become an increasingly important consideration as we learn more about the potential for risk-reduction in dementia. Local authorities and healthcare professionals should be mindful that an individual’s risk of developing dementia can be significantly determined by a number of factors. Some of these factors are fixed, such as ethnicity, learning disability, gender and others are caused by social or geographical factors. What’s clear is that addressing health inequalities should feed into the development of initiatives and the tailoring of messaging to promote dementia risk reduction, as well as in dementia care plans. Dementia is not an inevitable part of ageing but we know that the risk of developing dementia increases with age. This increased risk may be due to factors associated with ageing, such as higher blood pressure in midlife, an increased incidence of some diseases, and a weakening of the body's natural repair systems. There are at least 40,000 people under 65 in the UK who have dementia. This group of people may face increased stigma and difficulties particularly if they are carers for young children and are in employment. In the UK, the Equality Act 2010 obliges employers to provide reasonable work adjustments for disabled people living. It’s not known how employers have handled these requirements for employees with dementia, how challenges are dealt with once diagnosis is made and how capability and fitness for work is assessed. Reducing the stigma attached to dementia is an important step in enabling individuals to acknowledge and discuss any problems that they might be having at work because of their dementia. 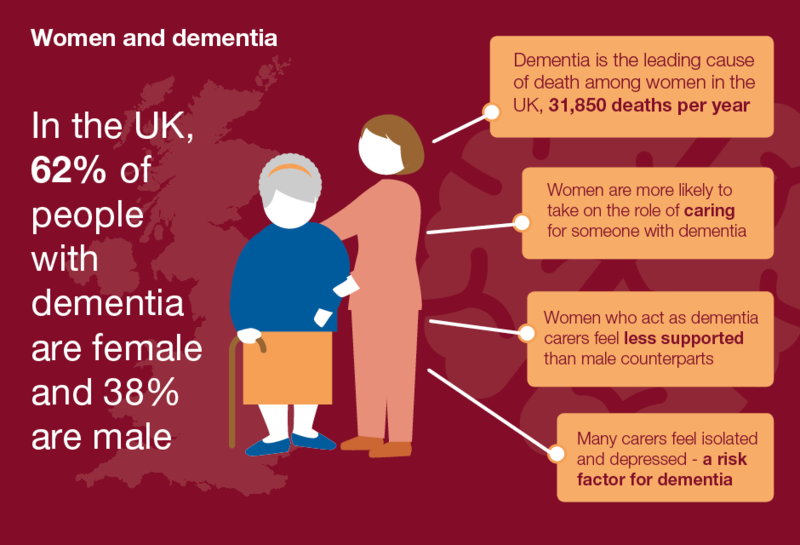 In the UK, 62% of people with dementia are female and 38% are male. This is likely to be down to the fact that women live longer than men and age is the biggest known risk factor for the condition. While some studies have suggested that other factors may affect the number of men and women with dementia, there is no firm evidence that women are more likely than men to develop dementia at any given age. Women are more likely to be dementia carers than men and this often leave them feeling isolated and depressed – a risk factor in itself for dementia. There is a greater prevalence, up to 4 times greater, of dementia in Black and South Asian ethnic groups. In 2011, there were 25,000 people with dementia from black, South Asian and ethnic groups in England and Wales. This number is expected to double to 50,000 by 2026 and rise to over 172,000 by 2051. People in these groups are more prone to risk factors such as cardiovascular disease, hypertension and diabetes, which increase the risk of dementia and contributes to increased prevalence. The prevalence of dementia is four times greater among people with a learning disability. Dementia is much more common in people with Down’s syndrome, and onset often begins earlier. People with other pre-existing health conditions such as diabetes, heart disease or depression are at greater risk of developing dementia. There are a number of dementia risk factors related to socio-economic position such as a lack of physical activity and early year’s education. There is a strong link between cigarette smoking and socio-economic group. Smoking has been identified as the single biggest cause of inequality in death rates between rich and poor in the UK. Smoking is one of the biggest risk factors for dementia and studies suggest that it can double the risk of developing the condition. This is an area that is only beginning to be addressed in dementia research, but studies have shown that 41% of older lesbian, gay and bisexual people live alone compared to 28% of heterosexual people. Loneliness and social isolation are risk factors for dementia. Little is known about the risk of dementia among the transgender community. Some culturally specific conceptualisations of dementia as a normal part of ageing or of having a spiritual, psychological or social cause have prevented many groups from seeking support. 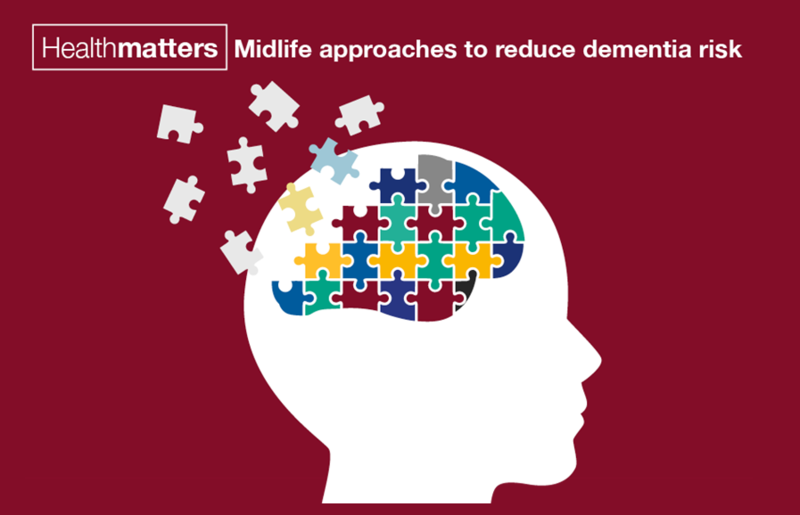 Reducing health inequalities is central to PHE’s mission and this edition of Health Matters takes a closer look at dementia health inequalities. It contains national as well as local data that can be used to help you identify and address health inequalities in your local area. PHE is building an inequality focus into each of its major programmes of work, such as the NHS Health Check programme, highlighted in this edition of Health Matters. Everyone should have the same opportunities to lead a healthy life, no matter where they live or who they are.